Yesterday I was going through my journal books from the early 90s to see if I could get a sense of how much bicycling I did when I lived in Davis California. I came across the list of my network contacts from January 1991 shown in the photo. 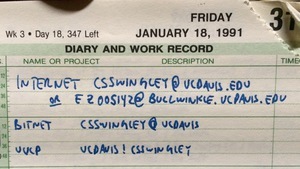 I had an email, bitnet and uucp address on the UC Davis computer system. I don’t have any record of actually using these, but I do remember the old email clients that required lines be less than 80 characters, but which were unable to edit lines already entered. I found the statistics for 109 of my bike rides between April 1991 and June 1992, and I think that probably represents most of them from that period. I moved to Davis in the fall of 1990 and left in August 1993, however, and am a little surprised I didn’t find any rides from those first six months or my last year in California. I rode 2,671 miles in those fifteen months, topping out at 418 miles in June 1991. There were long gaps in the record where I didn’t ride at all, but when I rode, my average weekly mileage was 58 miles and maxed out at 186 miles. To put that in perspective, in the last seven years of commuting to work and riding recreationally, my highest monthly mileage was 268 miles (last month! ), my average weekly mileage was 38 miles, and the farthest I’ve gone in a week was 81 miles. The road biking season is getting near to the end here in Fairbanks as the chances of significant snowfall on the roads rises dramatically, but I hope that next season I can push my legs (and hip) harder and approach some of the mileage totals I reached more than twenty years ago. Email myself a photo where the subject line has a keyword in it that procmail recognizes, sending the email off to a Python script. The Python script processes the email, extracting the photo name and caption from the text portion of the email, rotates and resizes the photo, and saves it in a place accessable from my web server. The photo metadata (size, when the photo was taken, caption and path) is stored in a database. A Django app generates the web page from the data in the database. 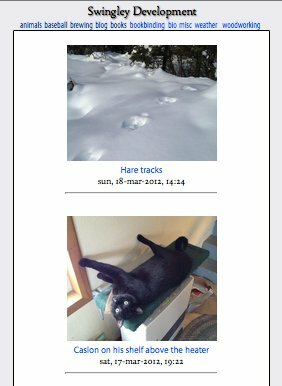 Once these pieces are wrapped together, called via procmail, and integrated into Django, it looks like this: photolog. There’s also a link to it in the upper right sidebar of this blog if you’re viewing this page in a desktop web browser.